This is probably the most outstanding recipe to-date you guys. 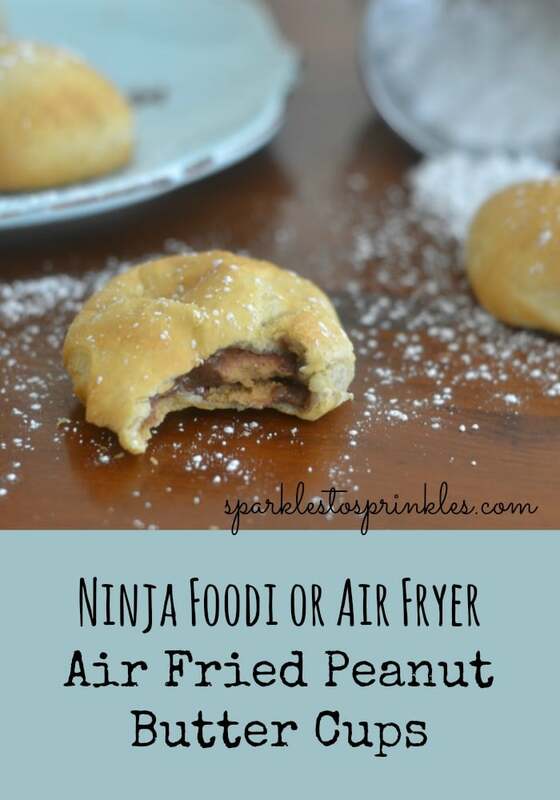 A Ninja Foodi or Air Fryer Air Fried peanut butter cup recipe that will blow your mind. 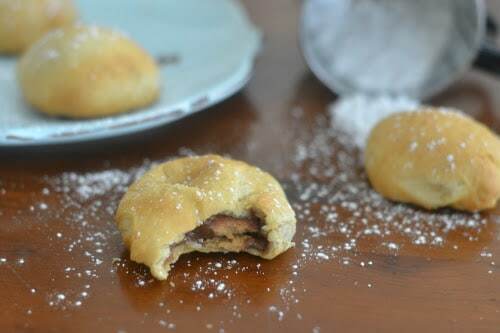 A melted peanut butter cup in the center of a pillowy dough that is cooked until golden brown. This is the most glorious fair food if you ever saw it, right next to air fried Oreos. 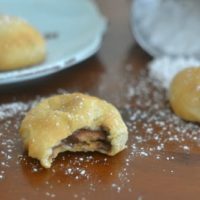 These Ninja Foodi or Air Fryer Air Fried Peanut Butter Cups are such a warm gooey peanut buttery treat you will be hooked after just one bite. After not ever having an air fryer before I am learning about some of the must-try Air Fryer recipes. These Air Fried Peanut Butter Cups are definitely a must try recipe. You have not fully lived your life until you have tasted an air fried peanut butter cup. So what is all the fascination behind frying up candy like peanut butter cups, Oreos, candy bars? Well, let me tell you, it is totally worth all the hype. I mean I love peanut butter cups like no other, but when they melt and marry with the dough that is wrapped all around them and baked up, it goes from the best dessert to can’t be beaten. At least in our house, that is how strongly we feel about air fried peanut butter cups. Freezing | Now, you can start by freezing your peanut butter cups if you want. This will help ensure they don’t melt apart. I personally skipped the freezing of the peanut butter cups and it worked just fine. Dough | Ensure that as you wrap up your peanut butter cup that it is completely sealed all around. If there is a crack, you will end up with a mess of a melted peanut butter cup all over your Air Fryer. So, take the time to wrap them up good. Don’t Overlap | Give each of your air fried cups room, and don’t allow them to touch. If they touch as they are getting cooked, you will end up with undercooked areas that are going to be doughy and not crispy. So leave adequate space and cook in batches. Serve Warm | These are best served warm. So once you pull them out of the Ninja Foodi or Air Fryer let them cool slightly then dive in. They can become slightly soggy as they cool down. I think you guys are going to love this recipe. Make sure to give them a try and let me know what you think. We make these a lot for a weekend treat after a long and hard week. Or if the kids are having a friend stay over, it is a nice little treat after dinner that is different than say cookies or cake. 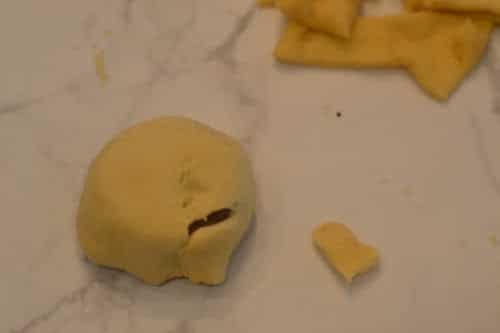 If you have any holes in your dough, take a small piece of dough, fit it over the hole and press until the dough attaches. The most delicious peanut buttery warm gooey decadent dessert Air Fried not deep fried. Wrap Peanut Butter Cups in crescent rolls. Cut off excess crescent dough that is not needed to cover the peanut butter cups. Spray the crisper basket well with canola spray. Place Peanut Butter Cups in the basket (neat side facing up), I fit 5 at a time. Air Crisp on 350 degrees for 5-6 minutes. Crisp until golden brown.